This carefully designed building, result of an international competition, has neat and sophisticated details of facade engineering. 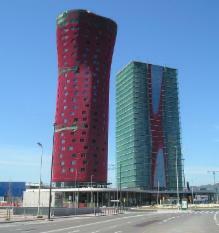 At the same time, due to the masterpieces it houses, it demands the highest quality and durability stadards. Estudio Marshall & Associates was hired by the owner to assist the architects during the design stages (In collaboration with Arup Facade Engineering) and then during the bidding, engineering, fabrication and installation stages of the glazed components of the facades. The main issues were the multilayered skylight of the main Hall and exhibition rooms, the curtain wall of the administration area and main Hall and the Glass Box at the Plaza Peru. Almost 100 years later Paul Scheerbart delighted the World with his “Glass Architecture” (1914), today this an everyday issue in architecture. This magnificent Rafael de La-Hoz Project is a delicate but strong expression of this architecture that uses glass to materialize a poetical proposal of a “inhabited garden”. Cristal clear glass facades, are almost ethereal, compared with the strong geometry and dimension of the “tree like” pillars. When you look at the building, the first you can see are these “trees”.These steel trees are the real supporting structure of the whole building where the slabs hang from. Behind the trees are the glass facades. 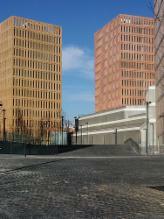 Two of the facades face the streets Fortuny y Rafael Calvo, they are flat and vertical. A third one in stone, faces a Petit Hotel form architect J.L. Sallaberry. The last one faces a neighbor building, it is positive sloped with a soft curvature. Shading devices are set in the intermediate space of the double skin. This allows the shading devices be outside the building, but protected from weather. At the same time, DF assures an interior environment free of street noises. 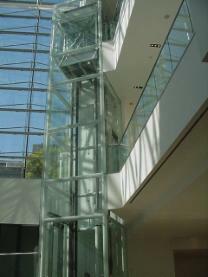 Low Iron glass used in all facades has a floor height span. 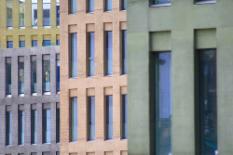 No doubt the main detail of these facades is the horizontal detail. It hoolds the catwalks and their supports, both glasses, air outlets and inlets, and the anchor system of the whole façade. 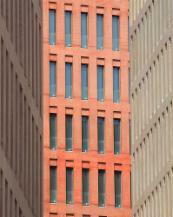 One of the outstanding features of the façade design is the absence of vertical frame elements. 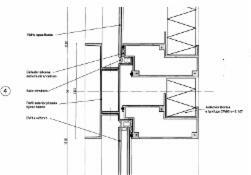 All supporting and weathertight elements are set at slab levels. 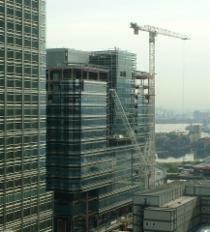 On the exterior glass panels ( the largest ) we performed a structural analysis using Finite Elements Method ( FEM ). We identified unacceptable deflection under wind load. 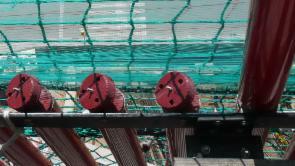 In order to lower these deflections we designed a special pressure clip anchored at a short vertical cantilever beam. Double skin facades are an optimal solution from the environmental point of view. Well managed incident solar energy can be used for helping interior hvac equipment. Solar energy can be used to cool down the façade because, due to stack effect, heated air tries to escape through the top openings, allowing fresh air to enter from the bottom. Any shading devices can be installed in the intermediate space, stopping the heat before in enters into the building. 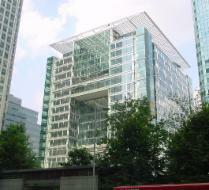 Energy is saved in two ways: due to the excellent U values obtained heat losses from the interior of the building are easily avoided, and through a proper management, due to the greenhouse effect, solar energy can be captured and redirected to the building contributing with the HVAC system. The curtain walls of this new terminal required sophisticated technical features (low exterior reflection, excellent acoustical insulation, safety and very precise formal intentions, and at same time they were to be built in a very constraint schedule and at the lowest cost. We designed a solution based upon an aluminium extrusion commercially available locally but with non conventional engineering. The envelope designed has exactly the formal appearance requested by the first sketches of the architects, with the desired acoustical values (Rw = 46 and thermal transmission (K=2.0) more that what you can expect from a very simple system. It allowed the contractor to comply with all the requirements and complete the job within schedule. Architects: Bodas - Miani - Anger Arqs. / Lopez - Rivarola - Cosenza Arqs. "The Facades of our buildings shape the quality of life we enjoy". With this quotation Hyder Consulting show their idea about the role of the facades in our time. Hyder Consulting, an english company with more than 150 years of activity abd with a task force of more than 2250 proffessionals working around the world, hired Estudio Marshall & Associates. 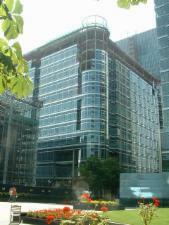 For three of their major projects (more than 50.000sqm each) in Canary Wharf, the heart of London, they hired us to provide field quality control services. 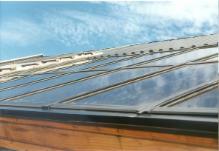 We performed routine controls on the panel, features, and glass roofs installation. We performed water and air infiltration field tests and coordination with architects and owners. with fresh air, as if it were a “Bamboo forest”. Estudio Marshall & Asocciates worked in this project from the very beginning of the curtain wall, storefront and louvers design stage taking part of the design team, preparing the engineering and specifications. Once the job was awarded, we worked during the whole process delivering consultancy services to the owner and the architects at the different stages, shop and site inspection, and lab and field testing of the curtain wall. Temple used for religious services by the Sefaradí Yesod Hadath Community, especially during summer season. This Synagogue is located by the sea in the heart of the luxurious seaside resort, Punta del Este in Uruguay. This magnificent Hugo Salama’s Design has a 400sqm glass skylight over the main hall of the temple. It was a real challenge for Estudio Marshall due to its proximity to the ocean and the harsh climate during the period of activities ( high diafanity, long hours of direct solar radiation, strong winds and thin-sand beach surroundings ). Our first decision was to do a precise study of the sun path and the incident solar radiation, in order to analyze its impact on the overheating of the building and the excess of illumination. This helped us establish that a Solar Factor Glass under 0.22 was needed, without loosing the architect’s requirements of transparency. At the same time, due to the lack of slope that offered the skylight geometry, we design a special aluminum system and structure to support the 1.8m x 1.8m glass panels. From technological point of view, we conceived each and every component of this building envelope; as if it were a boat, defining in first place its long lasting characteristics and low maintenance in an aggressive environment as is the coastal condition. Justice probably is the most sublime action of men and civilization. It is an moment when men judge other men’s actions in order to establish coexistence between them. 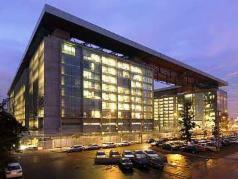 This project was the largest in Latin America t its time, due to its dimensions, more than 120.000sqm. The project responds to the climate requirements of the region, solving it with the creation of an exterior controlled space by its architectonic structure; witch enables the climate control of the group. Opened to north, a great water pond facing the west side, allows the parks humidification, using passive ways to offer an extreme energetic resource use, of sun light, lightning, natural ventilation, solving it with the minimum resources for excellent comfort conditions. Estudio Marshall teamed up with “ Vila – Sebastián – Vila Arquitectos ” (Argentina) and “ Cristián Boza & Asociados Arquitectos ” (Chile) to design these buildings envelopes. 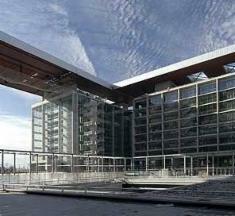 More than 90.000sqm of façade and more than 2000sqm of skylights were designed. One of the challenges the whole design team had, was to solve different types of facades by using sustainable and passive solutions, of climate control. Therefore, according to orientation and the destiny of the areas, we designed the following facades: a double skin façade, with assisted ventilation systems, a double skin façade with fixed sunshades, and a sloped single skin façade, immerse in a Reinforced Concrete “egg box-shaped mesh”. The above mentioned project was very special for us since it was our first international quality control project ( Montevideo – Uruguay ). We were involved with the engineering supervision, revision of construction details, follow up of bidding process, quality control manufacturing and installation and field testing of curtain wall. We joined the project team of “Estudio Guerra & Asociados” ( from Uruguay ) and together implemented different methodologies to develop a fluid communication and maintain updated information eventhough the distance. 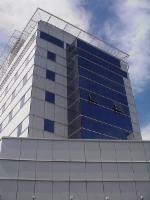 This building is well known in Sudamerica not only because of its size but for its high standards ( acoustical insulation, noise reduction, firebreak insulation and sanitary hygiene). The renovation and addition at the International Ezeiza Airport required of a glazed envelope proposal to give simultaneously the best solution to the following issues: fast fabrication and installation, very good acoustical and thermal insulation and a demanding esthetic resolution. Estudio Marshall & Associates hired by the architects developed the designs and wrote the specifications of all the glazed walls. The David Chipperfield project (London) developed locally by b720 Arquitectura SL (Barcelona) is a complex of 9 buildings home of Law courts. 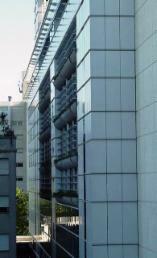 The main facades of the buildings were punched aluminum windows in a load bearing concrete façade. Since quantities were quite large (sixteen thousand 600mm x 2840mm tilt and turn windows), we understood that from the economical and the quality control point of view, ease and speed of construction was going to be a valuable issue. 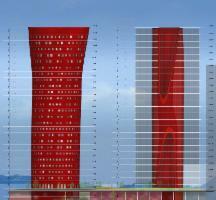 Estudio Marshall proposed a unitized façade system. Each unit has 3 operable windows and 3 insulating panels in 3600mm x 2840mm unit. These units were completely assembled and glazed at the shop, shipped to the site, and installed at an outstanding fast pace, preserving a superior quality. At the site, in front of each window, tempered glass lites were installed in order to produce a “box window” where, due to the stack effect, heated air escapes, allowing fresh air to cool down the windows, for refreshing purposes. This project proposed different curtain wall systems for the same building, depending on the orientations and the enclosed areas. An efficient thermal performance and an unusually short installation time were main issues. For the elongated side walls we designed a solution with opaque spandrel areas, very well isulated and long transparent vision areas with high performance IG units. For the main facades over Libertador avenue and Bartolome Cruz street the solution is different. 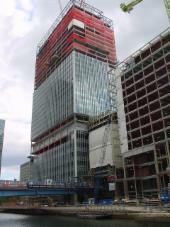 We preferred totally transparent glazed curtain walls with safety glazing. The interesting thing is that we solved both issues on all the systems with a Frame system that enabled us to build the facade at site in a very short time. 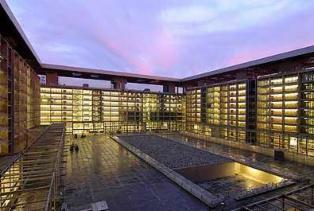 Architects: Santiago Alvarez Noblia & Asoc. 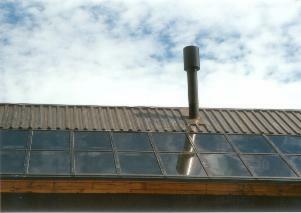 Ecohouse at Bariloche is he firs house in Argentina with a PV envelope (solar roof). Solar energy from photovoltaic elements (PV), is the transformation of the energy coming from the sun directly into electricity just exposing them to the sun. This is one of the renewable energies more environmentally friendly beacuse it produces electricity in a silent, smokeless and without any movement manner. Integration of this PV systems in the building envelopes is not an easy challenge that tends to achieve a major goal: "Use architecture to produce energy". Estudio Masrhall & Asossiate, in collaboration with European companies, started to work so tiem ago in the integration of PV systems in facades and roofs. In this project, Estuio Marshall designed the frame system that includes the PV panels that produce around 1/3 of the house annual estimated power demand. The system employed inventory aluminium extrusions specially adapted with an installation system to house the wires and at the same time ventilate the back of the system achieving an air and water tight roof with low maintenance, and the structural strength required to any roof in a snow area. 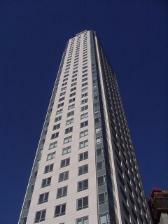 These elegant towers which have spacious apartments are on the “Rio de la Plata” coast. This unique location offers panoramic sightseeing and the buildings have to support strong climate challenges which are typical in this place, persistent winds during long periods of time (Sudestadas). This special situation required cladding with air tightness. Apart from the previously mentioned climate situation, we had to face the fact that the cladding chosen was aluminium windows tilt -turn, opening to the inside, thus producing a more complicated situation (in case of storms they will naturally tend to open). Estudio Marshall & Associates had to develop the design of quite delicate detailing and sophistication, aluminum extrusions, gaskets, shop drawings and cut sheets. We supervised the first prototypes and conducted the corresponding lab testing under the AAMA and ASTM standards. The result obtained shows high performance cladding, elegant design and low maintainance needs.